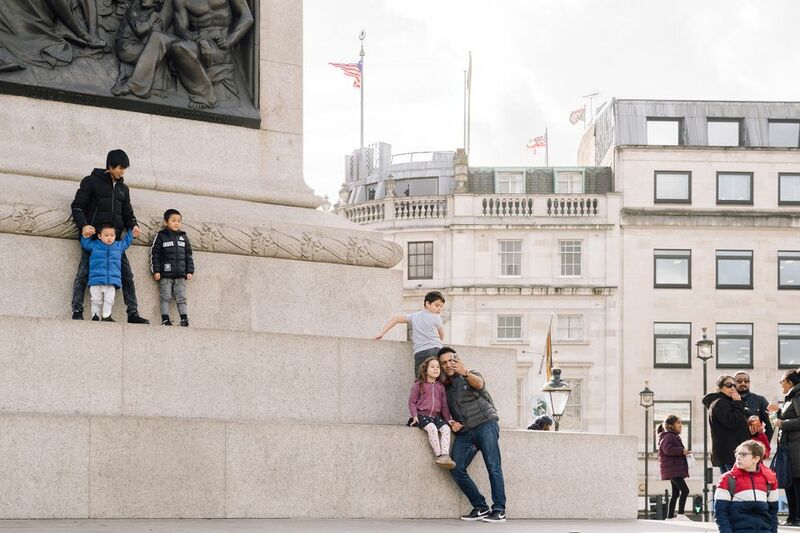 At first glance, London seems like both an expensive city and one that is not very child-friendly, but surprisingly, there is always something going on for children and families in the Big Smoke—and many of the best things are free! Children and their parents will be delighted by the incredible array of free museums, galleries, and attractions for kids of all ages to enjoy. Here's a list of 26 of our favorites. Kids will love heading to Buckingham Palace to watch the changing of the guard. Our advice: take a picnic and get there early to get a prime viewing spot. You can watch from outside Buckingham Palace and its gates or near Green Park, but The Mall is one of the best places to stake out—you'll be able to see the guards marching for much longer from here. This large, safe, outdoor play area is truly outstanding. The Diana Memorial Playground in Kensington Gardens, next to Kensington Palace, the former home of Diana Princess of Wales, is a fabulous children's playground for kids up to 12 years old. It's dominated by a giant pirate ship which children can climb all over, but there's also a sensory trail, areas for climbing and exploring as well as swings and slides. Staff is on site at all times, and no adults can enter without children (just as at Coram's Fields, another favorite London playground). If you stay for a while, there is a café and restrooms on site. London Docklands is a perennial favorite for adults who love seeing the contrast between the city's old and new architecture, but the museum has plenty of offer children as well. Housed in a 200-year-old warehouse, Docklands has the Mudlarks play area for children under 12. Everything is themed around life on the London docks, so while bigger kids can weigh cargo or load a tea clipper, smaller kids can pretend to drive a DLR (Docklands Light Railway) train. Coram's Fields is a unique seven-acre playground and park for children in central London. It is free to use and provides a safe and stimulating environment where children can play freely. Adults are only permitted with a child and there is always staff available to ensure all is well. Nearby, the Foundling Museum is always free for children and free for adults accompanying children during all Family Fun activities. Family Fun takes place in the Foundling Museum Education Center on the first Saturday of every month and is suitable for children ages 3 through 12. You can easily spend a day at the massive, beautiful Kew Gardens. Plus, children under 17 are admitted for free, making this an ideal affordable way to spend a day. Kids love to run around outdoors in the massive park, but it's also home to the Treetop High Walkway, which offers terrific views. There's also Climbers and Creepers, an indoor interactive play area for 3-9 year-olds and Treehouse Towers for 3-11-year-olds. Both are positioned next to a café and a family shop. Explore the gardens first as once the kids get here they won't want to leave! This South Kensington Museum may not have dinosaurs like the nearby Natural History Museum or lots of buttons to press like the nearby Science Museum but the V&A has an awful lot of free fun to offer families. The museum distributes Gallery Backpacks to little ones, which give families the chance to explore a gallery together with activities and fun ideas. This bronze statue of Peter Pan is located in Kensington Gardens, next to Hyde Park. The exact spot was chosen by Peter Pan's author, J.M. Barrie. Barrie lived close to Kensington Gardens and published his first Peter Pan story in 1902 using the park for inspiration. In his Peter Pan tale, The Little White Bird, Peter flies out of his nursery and lands beside the Long Water lake, on the spot where the statue now stands. The lower section of the statue has Peter Pan standing on a tree trunk covered with climbing squirrels, rabbits, and mice which can be fun to admire with shorter friends. The dinosaurs at the Natural History Museum are eternally popular, but there's a lot more to see than these prehistoric creatures. Head over to the Darwin Centre where you can see real scientists working and down to the Investigate Science Centre in the basement where adults and children alike will enjoy handling the animal, plant and geological treasures stored here. The Science Museum is one of the big three museums in South Kensington (the other two are the Natural History Museum and the V&A). The Science Museum was founded with objects that were on display at the 1851 Great Exhibition but now has the latest technology to help visitors of all ages learn about science. Kids aged 3 to 6 will squeal with delight in the basement "Garden," which has water-based, construction and sensory experiences, while 5 to 8 year-olds will enjoy the "Pattern Pod," where they can create patterns in many different ways. Bigger kids will love the IMAX cinema, and the museum's shop is outstanding. Mediatheque within BFI Southbank is an area for all ages to watch films and shows from the BFI's extensive collection. It's a single room within BFI Southbank where you're given headphones that can connect to each TV screen. Go to the desk, and they'll give you free access for a set amount of time (it's limited if others are waiting) then choose your show on-screen and enjoy! There are plenty of family viewing options but do keep children seated and quiet as other users are watching their chosen films too. London has many city farms and while most are free to visit, some welcome donations. Hackney City Farm has an award-winning cafe, as well as pigs, goats, sheep and more, but there's also Mudchute Park and Farm, the largest urban farm in the London area with 34 acres of open parkland. Mudchute also offers horseback riding, a tea shop, educational facilities, farm animals, and a boutique. Other options work checking out include Kentish Town City Farm, which has a wide range of livestock, poultry, and horses, and offers pony rides, Vauxhall City Farm which has donkey rides, pony-care classes, and milking demonstrations, and Stepney City Farm, a more rural farm in the the East End. As with most large museums and galleries in London, there is no admission charge at the National Gallery. The museum also offers its ArtStart system, which is ideal for creating a tour catering to youngsters. On Sundays, the gallery hosts regular storytelling and art workshops. Somerset House is a beautiful venue on a sunny day, primarily when the fountains are working in the courtyard as children love to run in and out of them (pack a towel and spare clothes). Knowing the appeal for families, Somerset House runs free family workshops each Saturday afternoon for 6-12-year-olds and some sessions for younger kids, too. For older children, you might want to consider the house's free guided tour. The Wallace Collection is a hidden treat just off the busy shopping area of Oxford Street that is home to stunning artworks and a collection of armor that will thrill children. The gallery is free to visit and has a drop-in art workshop on the first Sunday of the month as well as holiday activities. There are also audio guides and interactive tours for both adults and children, as well as fun family trails to follow. The pelicans in St. James's Park are fed fish at 2:30 p.m. each day. The park is quite big so you need to head for the opposite end to Buckingham Palace and they are fed from behind Duck Island Cottage, near Horse Guards Parade. The pelicans know when it's time as they wait there and keep watch for the man with the fish. Throwing the fish out takes just 10 minutes or so, but it's fun to watch, and you're in a park so the kids can have some outdoor 'run around' time too. The British Museum is free to visit, and while many visitors just want to see the Egyptian mummies or the Rosetta Stone, there are plenty of kid-friendly works here, too. Children are sure to love the Tang tomb figures, the mummified bull, and the ancient Sutton Hoo helmet. There are also daily free handling sessions and a children's multimedia guide available. This is the place to discover the history of London from prehistoric times right up to today. It's a chronological journey through this great city's history with displays you can interact with along the way. Sit in the Saxon building, try on a fireman's helmet from the Great Fire of London, and head downstairs to the Modern Galleries which include a recreated Georgian Pleasure Garden and the popular Victorian Walk. Children are sure to love the exhibition of a dead cat under a glass floor (by the printing press), part of a collection of objects found when excavating for the museum's extension in 2010. While beachcombing is popular at the seaside, London has the River Thames running through it which means locals love foreshore foraging, also called "mudlarking." The Thames is a tidal river so check the tide tables and safety advice then head off with a plastic bag for your collection. You're most likely to find broken clay pipes which are hundreds of years old which while abundant, are still a great piece of London history to take home for free. During Crystal Palace's renovations, Professor Richard Owen created a series of giant dinosaur sculptures for the park. Designed in 1852, these dinos were based on the best scientific information available at the time. While many people now giggle at the "anatomically incorrect" dinosaurs, they're still a delight for kids to see and play near. Plus, there's a free dinosaur audio trail to enhance your visit. If you decide to hang around, the park has lots more to see including a playground, a café, go-karts, a farm, a museum, a boating lake and a sphinx. The Imperial War Museum gives families the opportunity to see planes, missiles, tanks and other large-scale military exhibits in one building. You can learn about spies and climb through a bomber plane fuselage, experience the trenches of World War I and see the children's war exhibition which shows how youngsters were affected by war. As an added bonus, the café serves kid-friendly fare. Tate Modern is the national gallery of contemporary art and is housed in a former power station. The Turbine Hall is a large indoor space and many small people love running up and down the sloped floor. Luckily, all of the Tate galleries are very family friendly and it's not a quiet place so children can be themselves. The museum does have an area for children under five to explore, including an Interactive Zone which will entertain and challenge all age groups with games and multimedia ideas. And don't forget to go out on the balcony on the fourth level to look across the river Thames to ​St. Paul's Cathedral. While possibly not as kid-friendly as Tate Modern, Tate Britain is still a brilliant place to take the family. This is the national gallery of British art from 1500 to today and it's always free to visit. It has a really diverse collection of art from classical paintings to crazy contemporary sculpture so come and be inspired. Older kids can bring a pencil and pad to sketch in the galleries. This is a peaceful walk as you're away from the traffic and see a different side of London. It usually takes one or two hours and even small children will enjoy the walk with minimal complaints. Little Venice is a lovely area full of houseboats and even has a Puppet Barge so you could see a show before or after the walk. On the way to Camden, you'll pass London Zoo and can see a few animals and the Snowdon aviary. Once you reach Camden, reward yourself with a visit to Chin Chin Laboratorists for liquid nitrogen ice-cream! Covent Garden is well known for its street performers who entertain the public every afternoon in the West Piazza. Unlike performers in most other big cities, all performers at Covent Garden are licensed and have passed an audition to perform there. There can be big crowds, and audience participation is often part of the show. These entertainers make their living from these performances so when they collect money at the end, do give generously if you've enjoyed watching. There are also regular street performers on the South Bank, particularly near the London Eye. Tower Bridge lifts to allow large vessels to travel along The Thames and you can check the lift times before visiting. When the bridge is back down, traffic and pedestrians can go across, and it's fun to take children to stand on the join of the two sides. You can just about see the river below and kids like the rumble you can feel as traffic goes over the bridge. Don't forget to look up at the high walkways which can be visited. Children under five years old go free, and all get a card to collect stickers.